Battle Creek - Watch trains downtown near the Amtrak station and transit center. This is a major CN east-west freight route (20+ trains) which is also used by eight Amtrak trains and local Norfolk Southern freight traffic. Delray - Most railroads operating in Detroit come through Delray interlocking, which is located in southwest Detroit at Dearborn Avenue. NS, CN, CP and CSX trains come through this location - as many as 40 train movements each day. This is not a safe area and public parking is limited. Durand - Durand Union Station continues to be used by Amtrak twice a day. 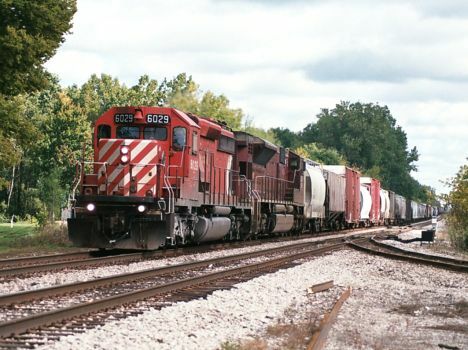 This is CN's east-west main line between Port Huron and the Chicago area with many through freights. CN also branches off here to go to Pontiac and Detroit. To the north, HESR operates local freights to Saginaw and Bay City. The Great Lakes Central also comes north through here from Ann Arbor, on the way to Owosso and Cadillac. Durand sees about 30 trains per day. Elkhart, Indiana - Elkhart hosts one of Norfolk Southern's largest classification yards, classifiying trains heading west to Chicago yards and beyond. It is also a refueling and recrew location for through east-west trains. The Grand Elk Railroad leaves the main line near the depot to head north to Kalamazoo and Grand Rapids. The Elkhart & Western is a local switching line which services Missauka. A parking lot next to the Amtrak station (former NYC station) is a good place to watch most trains in the area. Elkhart sees 40+ trains per day. Fostoria, Ohio - Fostoria is called the "Iron Triangle" because of the triangle created by the CSX former B&O east-west line, the CSX former C&O north-south line, and the Norfolk Southern northeast-southwest line. The City has established a public park within the triangle which has picnic and restroom facilities. It is a safe place to watch activity on all three routes, which can add up to 75 trains per day. Grand Rapids - This terminal is slower than in previous years but train movements can still be seen. Amtrak originates one train each way per day from the depot near downtown. The CSX is the largest operation in town with its east-west line from Detroit to Chicago. They have a major yard on the southwest side of downtown. Other shortlines operate from the city as well. Lapeer - Lapeer is on the CN east-west mainline from Port Huron to Chicago. It is a local trainwathers destination and a good spot to watch is at the Amtrak depot downtown. About 20 trains per day pass the depot, including two Amtrak trains. The Lapeer Industrial Railroad operates in town serving local businesses. Milan - Milan is on US-23 south of Ann Arbor and is a crossing of the Norfolk Southern line from Detroit to Indiana and the Ann Arbor Railroad heading north to its namesake town. CP Rail also operates about 8 round trips per day using NS trackage rights between Detroit and the Chicago area via Butler, Indiana. The AARR usually comes through town northbound in the late evening and then back south in the middle of the night. NS has a local switcher based in the Milan Yard which serve local industry. Oregon, Ohio (Toledo Docks) - This is a major CSX coal transloading facility. Coal trains from the south and east terminate at these yards and coal is transloaded into boats. CSX accesses the docks off their former Toledo Terminal belt line. Plymouth. Plymouth is the crossroads of the CSX in Michigan. The north-south line between Toledo and Flint crosses the east-west line between Detroit and Chicago via Grand Rapids. Local jobs handle traffic to the Ford plant and industrial facilities in nearby Livonia. There are 16-20 movements per day through Plymouth with the majority heading east and south. Plymouth is a safe town with plenty places to watch trains and take in other community activities and great restaurants. Port Huron - Port Huron is on the CN's main east-west main line between Toronto and Chicago. It is also the west portal of the international rail tunnel. One round trip Amtrak train originates here at the Amtrak depot, which is a good location to watch trains. There is also a branch line here off the CN from Port Huron to Detroit, and the CSX operates the former PH&D line south to industries in and near Marysville. CSX has trackage rights on the CN between Flint and Sarnia. Porter, Indiana - Porter in a junction of the Norfolk Southern main line from Elkhart to the Chicago area. It is also a junction to the Amtrak-owned line to Michigan, the CSX line to Grand Rapids and the NS line southwest to Gibson Yard in Calumet City. About 60 trains per day come through Porter. Romulus - Romulus is next door to Detroit Metropolitan Airport. It is the crossing of the east-west NS main line from Detroit to Indiana and the north-south CSX line from Plymouth to Toledo. CP trains use trackage rights on the NS through Romulus between Detroit and Chicago. This junction sees about 30 trains per day. South Bend, Indiana - South Bend is on the NS main line between Toledo and Chicago. The CN main line from Ontario to Chicago uses the NS line through downtown and they have a small yard on the west side of town. The South Shore passenger line storage yard is on the west side of town and they have a station at the airport. The downtown NS/CN line sees 60 trains per day though safe locations to view the joint route are limited. Swanton, Ohio - Swanton is a small town about 30 miles west of Toledo on the NS east-west main line between Toledo and Chicago. There are ample places to safety watch the parade of trains on the NS line, which number 30 per day. Trowbridge (East Lansing) - The CN main line between Port Huron and Chicago crosses the CSX main line between Detroit and Chicago via Grand Rapids. Amtrak also uses the CN line and their East Lansing depot is located about 1/4 mile east of the crossing. This crossing sees about 30 trains per day, with heavier traffic on the CN. There is limited public parking near the crossing. Walbridge, Ohio (Toledo) - Walbridge and nearby Stanley Yard are CSX' main terminals in Toledo. From Walbridge, their line to Michigan crosses the NS "water level" route at Vickers (1 mile north of Walbridge). Heading south, the CSX line goes to Fostoria and beyond. Stanley yard is about 2 miles west and most freight traffic is assembled there. A former Conrail line south also branches off from here. Stanley seems to be used for freight car classification and Walbridge Yard seems to be used for auto cars, and through coal trains. CSX has an overnight crew housing facility at Walbridge. There is substantial train traffic in the vicinity and the NS line is also nearby.